Chip by Kylie Howarth | Educate.Empower. We’ve all been there – sitting down by the ocean about to snack on a hot chip when swoop – out of your hand that delicacy is taken away by none other than a seagull. 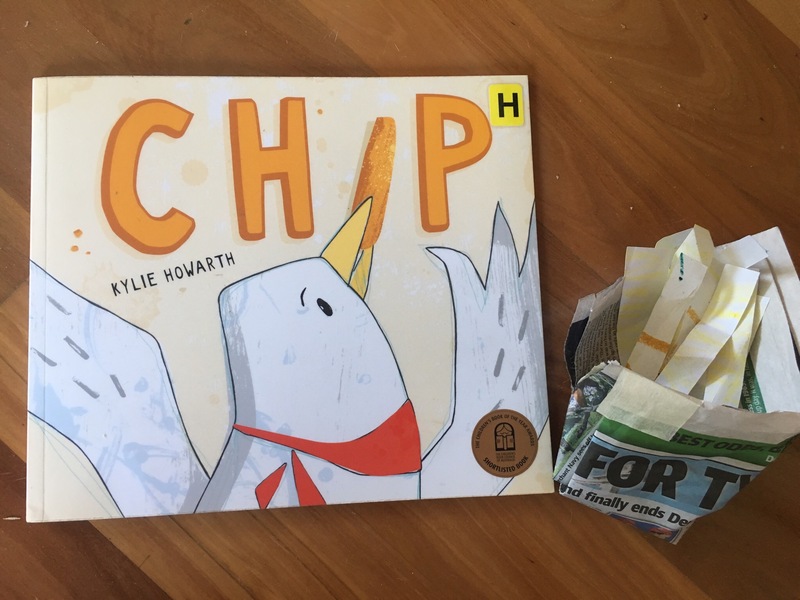 Chip by Kylie Howarth is a fun book that tells the tale of a seagull and his friends who are banned from the local fish and chip shop. The seagulls – so used to having food on tap are in distress and hungry! That is until Chip – our feathery hero comes up with an idea that is going to save the seagulls from impending starvation. You’ll have to read this book to believe that seagulls aren’t just those pesky birds who hassle you for your hot chips but rather creative, clever and charming friends. 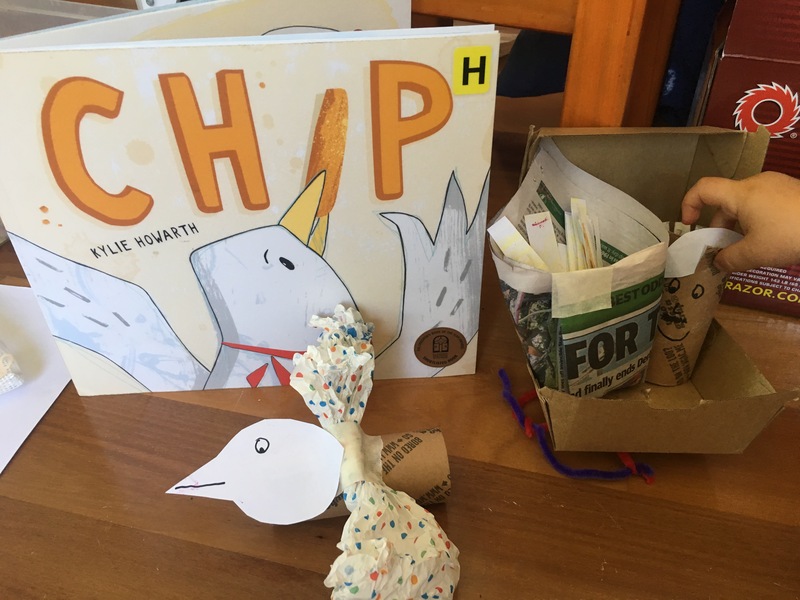 Kylie Howarth also has left a fantastic underlying message – seagulls aren’t meant to eat chips and if we all tidied up our mess, put it in the bin or even took the leftovers home perhaps these scavengers would hassle us as much. Many ocean birds do become sick when they eat too much of this unhealthy food and forget how to hunt for themselves. Unknowingly many of us are creating these creatures to behave the way they do by our simple attitude of not thinking about where our rubbish of left overs go. This book was shortlisted for the CBCA picture book of the year – and it was very well deserved! Think about where your food scraps go. Do you have a compost bin? Worm farm or chooks? If you don’t how can you minimise food waste? How can local councils ensure that people start to think about where they place their rubbish? What do seagulls usually eat and where do they usually live when not around humans? How can local councils and people help to stop local birds from pestering people? Kylie used the phrase – no fat chips, skinny chips, soggy chips, sandy chips, crunchy little bits of chips or even spicy chilli-dipped chips’ a few times in this story – why do you think she did this and how did it tie the story together at the start? How did Kylie’s illustations give you more detail about the story? Craft idea – We made our own hot chips using an old newspaper and some scrap paper we coloured in yellow! We then made a seagull out of toilet roll and the shop owner too. We then performed the book in our own words – lots of fun and a great way to build comprehension skills. This entry was posted in Book review, eco living, Environmental books, Parent tips, picture books, Picture books that address current issues, Teacher tips and resources by educateempower.blog. Bookmark the permalink. Sounds like a fun book with an important message. I like your craft activity too. Thanks Norah! We had fun making it all.